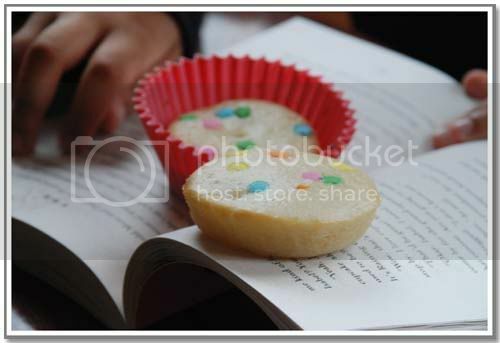 I love making cup cakes they are easy and always a hit with kids, well with me too. But hav eto admit never made one without eggs, should try and i too love sunitha's place. lemon and poppy seed muffins are my absolute favourite! though mine are with eggs. post is in the pipeline, actually! 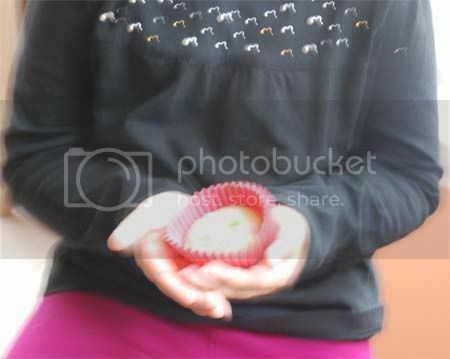 A cupcake recipe without butter? Sure to try, it is hard to give the kid a goodie and tell her not to move for photo shoot! You lucky bum! I've thought about a hand blender but my conscience is playing spoilsport. these sound super! i know what you mean about the fidgeting - soeren is like that and it's never easy. now i have my neighbor to pose for me!! 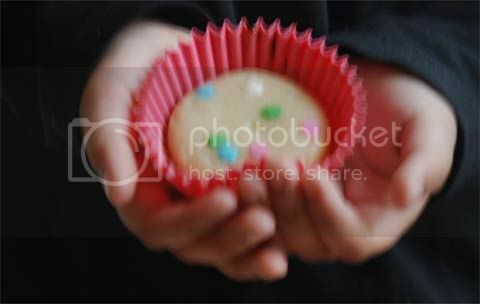 Lol you and the fidgeting little soul with a tasty treat in hand...lovely cupcakes Sandeepa, that too without butter. love the pics. They look beautiful dear with those sprinkles. 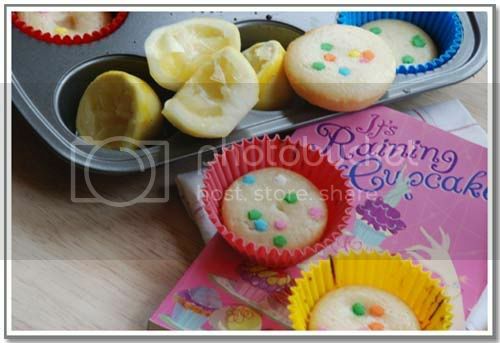 Recipe bookmarked:) no egg, no butter and lovely lemon. My kids actually run away if I call them when I am taking pictures:-D they know what is coming and hate it. Cute story, and very relevant too. I have my kids book fair this week, and i am quaking in my boots at the pink and purple frothy books that will come tumbling out of the shelves. very cute and lovely snaps, a really nice post. very new and mostly silent reader. Cute! Love those pictures with your lil one. Eta toh khub easy cupcakes ... barite lemon thaklei banano jaye. Those are such cute cupcakes and eggless and almost dairy free....lovely! those looks so delicious and I also prefer without frosting/icing ..and my daughter ,she wont sit quitely,continously talking Oke niye aajkal chobi tola difficult , last time ami try korchilaam,jeta hathe chilo ,ota top kore mokhe chole gelo..can I blame her for it?LOL..and congrats for the giveaway gift. Thanks to Little BS for sharing the lovely looking book cover with a lovely name with us. 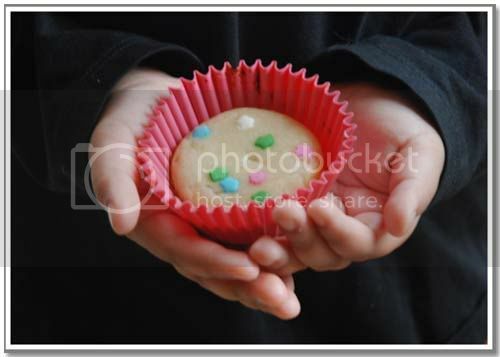 See she has grown up into a gracious young girl and helped you by posing with those cuty cuty butter less, #### less, $$$$less lemon cup cake in hand. She deserves a big hug and an additional cup cake for this kindness. no butter too? Did i see that right? Man, i have to make this now!! 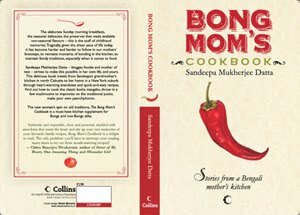 I simply loved this post.Thanks Sandeepa for sharing and yes thanks to all you bloggers who share lovely recipes and stories for the rest of us to enjoy! Sandeepa, I hear you about the fidgeting hands. Glad that you loved the cupcakes. No eggs, no butter, lots of lemon - gotta try.